If there’s one thing Samsung is good at—its displays. Those OLED panes of glass that are our pocket-friendly window into the internet keep improving with every generation. Even though Samsung didn’t pack in more pixels this year, the new Note 5 and S6 Edge+ displays are the best yet. The key element for a great smartphone has always been a truly innovative and top performing display, and the best leading edge smartphones have always flaunted their super high tech displays. It’s the display performance that determines how good and how beautiful everything on the smartphone looks, including camera photos, and also how usable and how readable the screen remains in high ambient lighting. It is the crown jewel of the smartphone. The Galaxy Note 5 and Galaxy S6 edge+ are Samsung’s new flagship smartphones with OLED displays. They have been releasing two OLED generations every year, each with significant improvements and enhancements – as a result OLEDs have developed into excellent high performance displays. This article is the latest edition in our five-year article series that has tracked and analyzed the development of mobile OLED displays and display technology, from its early beginnings in 2010, when OLED displays started out in last place, into a rapidly improving and evolving display technology that now has a commanding first place lead and continues pushing ahead aggressively. The Galaxy Note 5 and Galaxy S6 edge+ are two versions of the latest OLED display technology. The Galaxy Note 5 has a 5.7 inch high resolution Quad HD 2560x1440 pixel display with 518 pixels per inch on a hard glass substrate. While its screen size and resolution remain the same as the Galaxy Note 4, its display has significantly improved performance. The Galaxy S6 edge+ display is similar to the Note 5, with the same screen size and resolution, but it has a curved screen OLED display that is manufactured on a flexible plastic substrate so that it can bend around the corners on both the sides of the phone to provide two display areas that can be viewed and controlled from both the front or the sides, which is especially useful for viewing notifications and scrolling news items, and also as a dim night clock on a beside table. Our detailed Lab tests show that there have been a number of significant display performance improvements for the new Galaxy Note 5 including much higher peak brightness with significantly improved screen visibility and readability in high ambient light, plus significantly higher display power efficiency so it actually uses less power than the Note 4 in spite of its much higher brightness, and resulting in a number of new records for smartphone display performance, including the best absolute color accuracy of any mobile display that we have ever tested, and delivering absolutely stunning and beautiful images. We’ll cover these issues and much more, with in-depth comprehensive display tests, measurements and analysis that you will find nowhere else. Samsung provided DisplayMate Technologies with pre-release production units of the Galaxy Note 5 and Galaxy S6 edge+ so that we could perform our well known objective and comprehensive DisplayMate Lab tests, measurements, and analysis, explaining the in-depth display performance results for consumers, reviewers, and journalists. This article will focus primarily on the Galaxy Note 5, but we have also included a section with some test results for the Galaxy S6 edge+. To examine the performance of the new Galaxy OLED Displays we ran our in-depth series of Mobile Display Technology Shoot-Out Lab tests and measurements in order to determine how the latest OLED displays have improved. We take display quality very seriously and provide in-depth objective analysis based on detailed laboratory tests and measurements and extensive viewing tests with both test patterns, test images and test photos. To see how far OLED and LCD mobile displays have progressed in just five years see our 2010 smartphone Display Shoot-Out, and for a real history lesson see our original 2006 smartphone Display Shoot-Out. In this Results section we provide Highlights of the comprehensive DisplayMate Lab tests and measurements and extensive visual comparisons using test photos, test images, and test patterns that are covered in the advanced sections. The main Display Shoot-Out Comparison Table summarizes the Galaxy Note 5 Lab measurements in the following categories: Screen Reflections, Brightness and Contrast, Colors and Intensities, Viewing Angles, OLED Spectra, Display Power. You can also skip these Highlights and go directly to the Galaxy S6 edge+ Overview, and the Galaxy Note 5 Conclusions. Samsung has been systematically improving OLED display performance twice a year with each Galaxy generation since 2010. With the Galaxy Note 5there are many significant improvements over the Galaxy Note 4 that we tested a year ago, but also with the Galaxy S6 that we tested 6 months ago. The most impressive improvements for the Galaxy Note 5 are in Peak Brightness and screen readability and viewability in High Ambient Light, and in its display Power Efficiency, which we discuss in turn below. The Galaxy Note 5 and Galaxy S6 edge+ both have a 5.7 inch Quad HD 2560x1440 pixel display, currently the highest resolution for smartphones, with 3.7 Mega Pixels, almost double the number on your HDTV. It provides lots of image detail – it can display four complete HD 1280x720 images at once. The display has Diamond Pixels (see below) and Sub-Pixel Rendering with 518 pixels per inch (ppi), providing significantly higher image sharpness than can be resolved with normal 20/20 Vision at the typical viewing distances of 10 inches or more for smartphones, so the display appears perfectly sharp. There are some significant advantages in going higher than the visual acuity for 20/20 Vision for typical viewing distances. For smartphones they include a closer match to digital photo resolutions, the ability to display Full HD 1920x1080 images with an additional 1.6 Mega Pixels left over for displaying additional content at the same time, plus efficient and simple rescaling (with small integer ratios) of various HD and Quad screen resolution formats to improve processing efficiency and resulting picture quality with fewer scaling artifacts. I was especially glad to see that Samsung decided to keep the Galaxy Note 5 and Galaxy S6 edge+ resolutions at 2560x1440 pixels with 518 ppi and instead concentrated on increasing the display’s peak brightness and improving its performance in high ambient light, which has real demonstrable and easy to see visual benefits that every consumer will immediately appreciate. We’ll discuss this important issue and how to improve the Next Generation of Mobile Displays below. One very important capability of the Galaxy smartphones that is often overlooked by many consumers and reviewers, is its set of user selectable Screen Modes. Most smartphones and Tablets only provide a single fixed factory display Color Gamut and color calibration, with no way for the user to alter it based on personal preferences, running applications, or Ambient Light levels. A very important capability provided by the OLED Galaxy smartphones is the implementation of Color Management that provides a number of user selectable Screen Modes, each with different Color Gamuts and levels of Color Saturation and display calibration based on user and application preferences. Color Management with multiple and varying Color Gamuts are a very useful and important state-of-the-art capability that all displays will need to provide in the future. The Galaxy Note 5 and Galaxy S6 edge+ both have four user selectable Screen Modes: Adaptive Display, AMOLED Photo, AMOLED Cinema, and the Basic Screen Mode, which matches the Standard sRGB / Rec.709 Color Gamut that is used for producing virtually all current consumer content. See this Figure for the Color Gamuts of the different tested Screen Modes and the Colors and Intensities section for measurements and details. Note that the Adaptive Display mode is the standard and factory default Screen Mode. Use Display Settings menu to switch between the three other available Screen Modes. We discuss each of the tested Screen Modes next. The Adaptive Display screen mode provides real-time adaptive processing to dynamically adjust images and videos – for some applications it will vary the White Point, Color Gamut, and Color Saturation based on the image content and the color of the surrounding ambient lighting measured by the Ambient Light Sensor (which measures color in addition to brightness). The Adaptive Display mode also delivers significantly higher Color Saturation, with a large 134 percent of the Standard sRGB / Rec.709 Color Gamut, among the highest that we have ever measured for smartphones and Tablets. Some people like the extra saturated and vibrant colors, plus it is useful for special applications, and for viewing the display in medium to high levels of Ambient Light, because it offsets some of the reflected light glare that washes out the on-screen image colors. Most high-end digital cameras have an option to use the Adobe RGB Color Gamut, which is 17 percent larger than the Standard sRGB / Rec.709 Color Gamut used in consumer cameras. The AMOLED Photo screen mode on the Galaxy Note 5 provides a very accurate calibration to the Adobe RGB standard, which is rarely available in consumers displays, and is very useful for high-end digital photography and other advanced imaging applications. The measured Absolute Color Accuracy of the AMOLED Photo screen mode for the Galaxy Note 5 is 1.6 JNCD, which is very high accuracy. See this Figure for an explanation and visual definition of JNCD and the detailed Color Accuracy Plots showing the measured Color Errors throughout the Gamut. There are very few consumer displays that can accurately reproduce the Adobe RGB Gamut, so this is a significant plus for serious photography enthusiasts. See the Color Accuracy section and the detailed Color Accuracy Plots for measurements and details. The Basic screen mode provides a very accurate Color and White Point calibration for the Standard sRGB / Rec.709 Color Gamut that is used to produce virtually all current consumer content for digital cameras, TVs, the internet, and computers, including photos, videos, and movies. The Color Gamut of the Basic screen mode is very accurate, with a nearly perfect 101 percent of the Standard sRGB / Rec.709 Color Gamut. Even better, the measured Absolute Color Accuracy for the Note 5 Basic screen mode is an impressive 1.4 JNCD, the most color accurate display that we have ever measured for a smartphone or Tablet, which is visually indistinguishable from perfect, and is very likely considerably better than your living room TV. See this Figure for an explanation and visual definition of JNCD and the detailed Color Accuracy Plots showing the measured display Color Errors, and also this regardingBogus Color Accuracy Measurements. This article on Absolute Color Accuracy includes an in-depth analysis and comparison of six flagship smartphones and Tablets. Use the Basic screen mode for the best color and image accuracy, which is especially important when viewing photos from family and friends (because you often know exactly what they actually should look like), for some TV shows, movies, and sporting events with image content and colors that you are familiar with, and also for viewing online merchandise, so you have a very good idea of exactly what colors you are buying and are less likely to return them. See the Color Accuracy section and the detailed Color Accuracy Plots for measurements and details. Mobile displays are often used under relatively bright ambient light, which washes out the image colors and contrast, reducing picture quality and making it harder to view or read the screen. To be usable in high ambient light a display needs a dual combination of high screen Brightness and low screen Reflectance – the Galaxy Note 5 has both. For most image content the Galaxy Note 5 provides over 440 cd/m2 (Luminance, which is a measure of Brightness sometimes called nits), comparable or higher than most LCD displays in this size class. Its Screen Reflectance is 4.7 percent, close to the lowest that we have ever measured for a smartphone. Our Contrast Rating for High Ambient Light quantitatively measures screen visibility and image contrast under bright Ambient Lighting – the higher the better. As a result of its high Brightness and low Reflectance, the Galaxy Note 5 has a Contrast Rating for High Ambient Light that ranges from 86 to 116, among the highest that we have ever measured. More importantly, on the Galaxy Note 5 the Maximum Brightness can go much higher when Automatic Brightness is turned On, so that users can’t permanently park the Manual Brightness slider to very high values, which would run down the battery quickly. High screen Brightness is only needed for High Ambient Light, so turning Automatic Brightness On will provide better high ambient light screen visibility and also longer battery running time. When Automatic Brightness is turned On, the Galaxy Note 5 produces up to an impressive 861 cd/m2 (nits) in High Ambient Light, where high Brightness is really needed – it is the brightest mobile display that we have ever tested. As a result of its high Brightness and low Reflectance, the Galaxy Note 5 has a Contrast Rating for High Ambient Light that ranges from 118 to183, also the highest that we have ever measured for any mobile display. See theBrightness and Contrast, the High Ambient Light and the Screen Reflections sections for measurements and details. The Galaxy Note 5 also has a Super Dimming Mode that allows the Maximum Screen Brightness to be set all the way down to just 2 cd/m2 (nits) using the Brightness Slider. This is perfect for night use on a beside table, and useful for working comfortably without eye strain or bothering others in very dark environments, or affecting the eye’s dark adaptation, such as when using a telescope. The display still delivers full 24-bit color and the picture quality remains excellent. With each successive generation Samsung has been systematically improving the power efficiency of their OLED displays. We measured an impressive 21 percent improvement in display power efficiency between the Galaxy Note 4 and the Note 5. It is the higher display power efficiency that allows the display brightness to increase without also increasing the display power – the Note 5 display actually uses less power than the Note 4 in spite of its much higher brightness. The Galaxy Note 5 also has an Ultra Power Saving Mode that lowers the Screen Brightness and also sets the background to Black, both of which significantly reduce display power and can double the running time on battery. See the Display Power section for measurements and details. While smartphones are primarily single viewer devices, the variation in display performance with viewing angle is still very important because single viewers frequently hold the display at a variety of viewing angles. The angle is often up to 30 degrees, more if it is resting on a table or desk. While LCDs typically experience a 55 percent or greater decrease in Brightness at a 30 degree Viewing Angle, the OLED Galaxy Note 5 display shows a much smaller 24 percent decrease in Brightness at 30 degrees. This also applies to multiple side-by-side viewers as well, and is a significant advantage of OLED displays. The Color Shifts with Viewing Angle are also relatively small. See the Viewing Angles section for measurements and details. The Galaxy Note 5 Basic screen mode provides very nice, pleasing and very accurate colors and picture quality. Although the Image Contrast is slightly too high (due to a slightly too steep Intensity Scale), the very challenging set of DisplayMate Test and Calibration Photos that we use to evaluate picture quality looked absolutely stunning and Beautiful, even to my experienced hyper-critical eyes. The Basic screen mode is the most color accurate mode and is recommended for indoor and low ambient light viewing of standard consumer content for digital camera, TV, internet, and computer content, including photos, videos, and movies, and also for your online purchases in order to see accurate product colors. The Adaptive Display screen mode has significantly more vibrant and saturated colors. Some people like that. It is also recommended for viewing in medium to high levels of ambient light because it offsets some of the reflected light glare that washes out the image colors. Along with the Galaxy Note 5, Samsung is also introducing the Galaxy S6 edge+, which is almost identical to the Galaxy Note 5 except that it has a very innovative curved OLED display that extends and bends around to both the right and left side edges of the phone. It lacks the standard Note S-Pen, which is why it’s called a Galaxy S6, although the screen size and resolution are the same as the Note 5. The curved Galaxy S6 edge+ provides two additional configurable display areas that can be viewed from both the front or the sides, or when the phone is placed face down. The Galaxy S6 edge+ is actually a flexible OLED display manufactured on a flexible plastic substrate rather than on a traditional perfectly flat and hard screen like almost all other OLED (and LCD) displays. This allows the display itself to bend, but it is then placed underneath a hard Gorilla Glass 4 cover for protection and to maintain its desired shape, which for the Galaxy S6 edge+ is curved along the entire right and left side edges. The curved Galaxy S6 edge+ screen provides a rotating carrousel of edge screens that you can flip through with your finger to see the time, weather, color coded notifications like incoming and missed calls, messages and Emails, plus several active news feeds that continuously scroll along the Edge (including the Twitter, Yahoo Finance, Sports, and Stocks). The curved Edge screen provides an important User Interface enhancement for smartphones. It’s quite functional and useful, and even fun watching and cycling through the various Edge screens. Since the pixels on OLED displays are all powered independently, the main and Edge screens can be either turned on and off together or separately. Monitoring with just the Edge screen turned on significantly reduces display power and can significantly extend the running time on battery. There is a night clock that will dimly show the time all night long on the Edge screen (using very little power because only a small section of the OLED screen is active) so it’s also a nice alarm clock as well. What is especially news worthy and significant is that the performance of the OLED display on a flexible plastic substrate for the Galaxy S6 edge+ is now essentially the same as on a traditional glass substrate for the Galaxy Note 5, even at 500+ pixels per inch and 2560x1440 resolution. The most important point is that curved and flexible displays are definitely the wave of the future because they offer many important visual and functional advantages for both mobile displays and TVs as explained in our 2014 Innovative Displays and Display Technology article. Follow DisplayMate on Twitterto learn about our Galaxy Note and upcoming display technology coverage. What is particularly significant and impressive is that Samsung has been systematically improving OLED display performance with every Galaxy generation since 2010, when we started tracking OLED displays. The first notable OLED smartphone, the Google Nexus One, came in decidedly last place in our 2010 smartphone Display Shoot-Out. In a span of just five years OLED display technology is now challenging and even exceeding the performance of the best LCDs. The Galaxy Note 5 continues this impressive systematic improvement in OLED displays and technology. 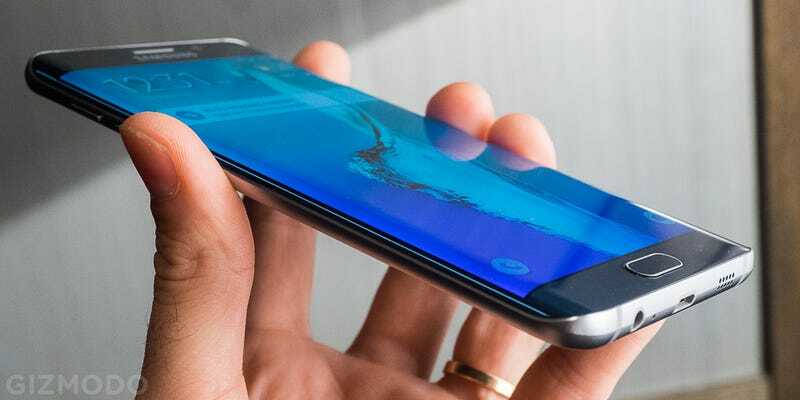 The Galaxy Note is the flagship product line where Samsung generally introduces its major OLED display technology improvements and enhancements. While the Galaxy Note 5 screen size and resolution remain the same as the Galaxy Note 4, its display has significantly improved performance. Based on our extensive Lab tests and measurements listed below, the Galaxy Note 5 is the best performing smartphone display that we have ever tested. It takes over from the Galaxy Note 4, which was the previous record holder for mobile display performance. Highest Absolute Color Accuracy (1.4 JNCD), Highest Peak Brightness (861 nits), Highest Contrast Rating in Ambient Light (183), Highest Screen Resolution (2560x1440), Highest (infinite) Contrast Ratio, and Smallest Brightness Variation with Viewing Angle (24 percent). In addition, almost every display lab test and measurement shows some improvements compared to the Galaxy Note 4, the previous record holder, including slightly lower Screen Reflectance (4.7 percent), an 18 to 23 percent improvement display Brightness, and a 21 percent improvement in display power efficiency, so the Note 5 display actually uses less power than the Note 4 in spite of its much higher brightness. See the main Display Shoot-Out Comparison Table for all of the measurements and details. The Galaxy Note 5 has raised the bar for top display performance up by another notch. The Galaxy S6 edge+ is Samsung’s fourth generation of flexible OLED displays. Its has essentially identical display performance to the Galaxy Note 5 except for its curved screen. The curved edge screen provides an important User Interface enhancement for smartphones that we have described above. It’s quite functional and useful, and even fun watching and cycling through the various Edge screens. Flexible OLEDs are at the cutting edge and future of OLED technology. The current models are flexible but are maintained permanently curved and rigid under Gorilla glass – that can and will change in the future, leading to truly flexible, bendable, and foldable OLED display screens. One very important capability of the Galaxy smartphones that is often overlooked by many consumers and reviewers, is its set of user selectable Screen Modes. Most smartphones only provide a single fixed factory display color calibration, with no way for the user to alter it based on personal preferences, running applications, or ambient light levels. Samsung has implemented Color Management for their OLED smartphones and Tablets allowing them to provide multiple Screen Modes with different Color Gamuts and color calibrations – other smartphones only provide a single fixed screen Color Gamut and color calibration. This Figure shows the different Color Gamuts. Color Management with multiple and varying Color Gamuts are a very useful and important state-of-the-art capability that all displays will need to provide in the future. All of the recent Galaxy models including the Note 5 and S6 edge+ have this important capability – see the Next Generation of Mobile Displays section below. The Galaxy Note 5 Basic screen mode has the most accurate display colors for reproducing all standard consumer content (sRGB / Rec.709) of any smartphone or Tablet display that we have ever tested, with a measured Absolute Color Accuracy of 1.4 JNCD, which is visually indistinguishable from perfect, and is very likely considerably better than your living room TV. The previous record holder was the Galaxy Note 4. See our detailed Absolute Color Accuracy Plots and also this regarding Bogus Color Accuracy Measurements. Good Color Accuracy is especially important when viewing photos from family and friends (because you often know exactly what they actually should look like), for some TV shows, movies, and sporting events with image content and colors that you are familiar with, and also for viewing online merchandise, so you have a very good idea of exactly what product colors you are buying and are less likely to return them. Select the Basic Screen Mode using Display Settings – it is not the default screen mode for the Galaxy Note 5. Most high-end digital cameras have an option to use the Adobe RGB Color Gamut, which is 17 percent larger than the standard sRGB / Rec.709 Color Gamut used in consumer cameras. The AMOLED Photo screen mode on the Galaxy Note 5 provides a very accurate 1.6 JNCD calibration to the Adobe RGB standard, which is rarely available in consumer displays. It is very useful for viewing high-end digital photos and other advanced imaging applications. This is a significant plus for serious photography enthusiasts. Select the AMOLED Photo screen mode using Display Settings – it is not the default screen mode for the Galaxy Note 5. The Galaxy Note 5 OLED display’s native Wide Color Gamut Adaptive Display screen mode has significantly more vibrant and saturated colors with its 134 percent of the Standard (sRGB / Rec.709) Color Gamut, among the highest that we have ever measured for smartphones and Tablets. Some people like the extra saturated and vibrant colors, plus it is useful for special applications and is recommended for viewing in medium to high levels of ambient light because it offsets some of the reflected light glare that washes out the on-screen image colors. Select the Adaptive Display screen mode using Display Settings – note that Adaptive Display is the factory default screen mode for the Galaxy Note 5. With each successive generation Samsung has been systematically improving the power efficiency of their OLED displays. We measured an impressive 21 percent improvement in display power efficiency between the Galaxy Note 4 and Note 5. It is the higher display power efficiency that allows the display brightness to increase without also increasing the display power – the Note 5 display actually uses less power than the Note 4 in spite of its much higher brightness. While LCDs remain more power efficient for images with mostly full screen white content (like all text screens, for example), OLEDs are now more power efficient for mixed text and image content because they are emissive displays so their power varies with the overall Average Picture Level (average Brightness) of the image content. The Galaxy Note 5 is 37 percent more power efficient than the iPhone 6 Plus for mixed content, which includes text together with image content like photos, videos, and movies that generally have a 50 percent (or less) Average Picture Level, APL. The OLED / LCD Power Efficiency Crossover is currently at 67 percent APL Average Picture Level: the OLED display on the Galaxy Note 5 is more power efficient for APLs less than 67 percent, and the LCD display on the iPhone 6 Plus is more power efficient for APLs greater than 67 percent. If this keeps up then OLEDs may pull ahead of LCDs in total power efficiency in the near future… See the Display Power section for measurements and details. The most important improvements for both OLED and LCD mobile displays will come from improving their image and picture quality and screen readability in real world ambient light, which washes out the screen images, resulting in reduced image contrast, color saturation, and color accuracy. The key will be in lowering screen Reflectance and implementing Dynamic Color Management with automatic real-time modification of the display’s native Color Gamut and Intensity Scales based the measured Ambient Light level in order to have them compensate for the reflected light glare and image wash out from ambient light as discussed in our 2014 Innovative Displays and Display Technology and SID Display Technology Shoot-Out articles. The displays, technologies, and manufacturers that succeed in implementing this new real world high ambient light performance strategy will take the lead in the next generations of mobile displays… Follow DisplayMate on Twitter to learn about these developments and our upcoming display technology coverage. Below we examine in-depth the OLED display on the Samsung Galaxy Note 5 based on objective Lab measurement data and criteria. For comparisons and additional background information see the Galaxy Note 4 Display Technology Shoot-Out, the Galaxy S6 Display Technology Shoot-Out, and theOLED Tablet Display Technology Shoot-Out. For comparisons with the other leading smartphone, Tablet and Smart Watch displays see our Mobile Display Technology Shoot-Out series. All smartphone and Tablets displays can be significantly improved using DisplayMate’s proprietary very advanced scientific analysis and mathematical display modeling and optimization of the display hardware, factory calibration, and driver parameters. We help manufacturers with expert display procurement, prototype development, testing displays to meet contract specifications, and production quality control so that they don’t make mistakes similar to those that are exposed in our public Display Technology Shoot-Out series for consumers. This article is a lite version of our advanced scientific analysis – before the benefits of our DisplayMate Display Optimization Technology, which can correct or improve all of these issues. If you are a display or product manufacturer and want to significantly improve display performance for a competitive advantage then Contact DisplayMate Technologies. DisplayMate Technologies specializes in proprietary advanced scientific display calibration and mathematical display optimization to deliver unsurpassed objective performance, picture quality and accuracy for all types of displays including video and computer monitors, projectors, TVs, mobile displays such as smartphones and tablets, and all display technologies including LCD, OLED, 3D, LED, LCoS, Plasma, DLP and CRT. This article is a lite version of our intensive scientific analysis of smartphone and smartphone mobile displays – before the benefits of our advanced mathematical DisplayMate Display Optimization Technology, which can correct or improve many of the display deficiencies. We offer DisplayMate display calibration software for consumers and advanced DisplayMate display diagnostic and calibration software for technicians and test labs.